Almost two months away from this year’s Carrier Classic, there are already plans in motion for next year’s. And although recent or planned sports-on-a-ship contests have expanded to include baseball, basketball on amphibs and hockey, next year’s Classic might top them all. 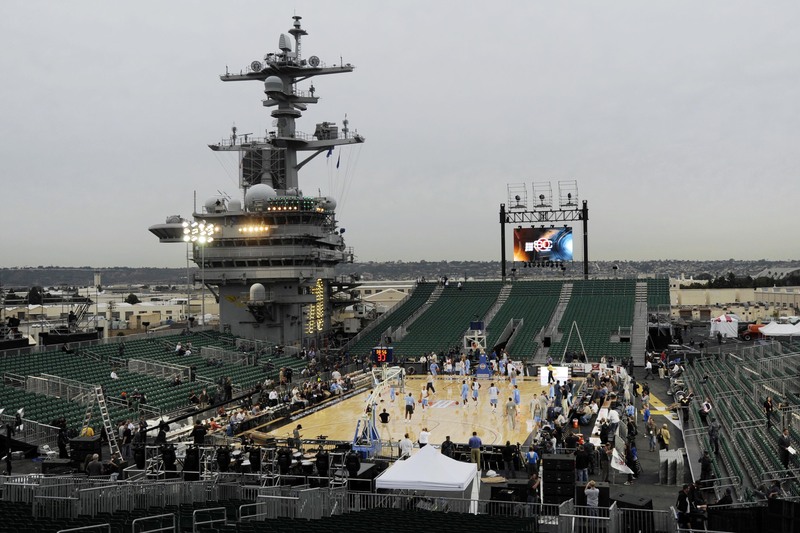 According to reports, the 2013 Carrier Classic could involve eight teams in four games emanating from four different ships, including the decommissioned carriers Yorktown (in South Carolina, site of this year’s event) and Midway (in San Diego, site of a competing event). Possible teams include Texas, Gonzaga, N.C. State, Missouri, Florida State and Davidson. The original report included Kentucky, but an update called the Wildcats “highly unlikely” participants. This year’s Carrier Classic, a college basketball doubleheader scheduled for Nov. 9, will air on NBC Sports Network, with the Ohio State-Marquette men’s matchup airing live at 7 p.m. and the women’s OSU-Notre Dame game airing on tape delay at 11 p.m. The Army and Air Force men’s teams could play on the carrier the following day as part of a four-team tournament hosted by The Citadel, but those games haven’t been confirmed for the flattop. At this rate, expect a “Carrier Madness” tournament to last much of November 2014 and feature every available military flattop except this one. Meanwhile, as the carrier-team total closes in on two dozen, the Navy men and women haven’t been mentioned as potential shipboard combatants. If the games are going to multiply each year, can’t the home team get a shot?